TelASK Remind - TelASK Technologies Inc. - Improving patient outcomes while reducing healthcare costs. TelASK email reminders are sent with your email address. This increases open rates and appointment confirmations. The date and time of the appointment is displayed as an .ICS file. 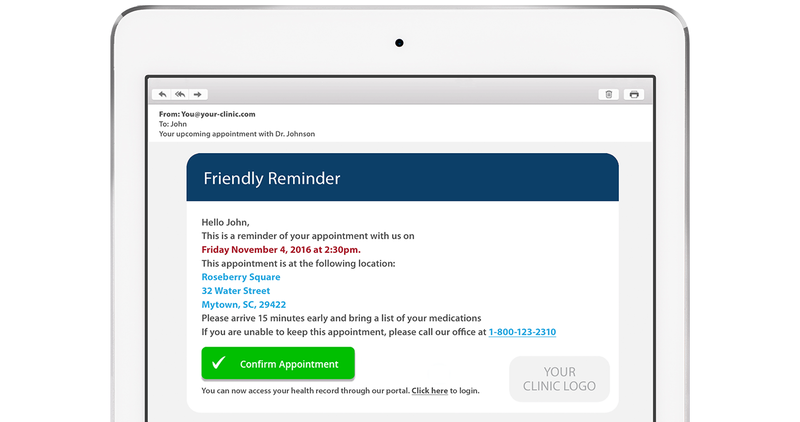 This allows your patient to easily add the appointment to their calendar. The appointment location appears as a hyperlink to googlemaps™ so patients can easily get directions. Detailed instructions can be included to ensure patients arrive prepared. Patients appreciate knowing what is expected of them. Patients confirm they plan to attend with a simple click. Confirmation is posted in your system electronically. Include hyperlinks to educational material or to the patient’s portal in the EMR. TelASK call scripts are all recorded by professional voice talents and sound friendlier than robotic voices. This increases call acceptance and confirmation rates. TelASK can detect when a call goes to voicemail. Depending on pre-determined business rules it can either leave a message or retry later. A busy signal means that someone is there to take the call as soon as they hang up. When TelASK reaches a busy signal, it initiates a retry after a short interval. Calls can invite patients to respond by pressing different numbers on their telephone keypad. One number will trigger a confirmation being sent to the EMR. Another number can be programmed to redirect the call to your office or to a third party answering service. TelASK Reminder calls display your Caller ID so the patient recognizes that it is your organization calling. TelASK does not use your office telephone lines to initiate calls. When a patient clicks on confirm TelASK can send another text to the patient thanking them. TelASK uses the patients name in the message. This way they are more like to read it. Texts can contain hyperlinks to useful information such as directions or special instructions. 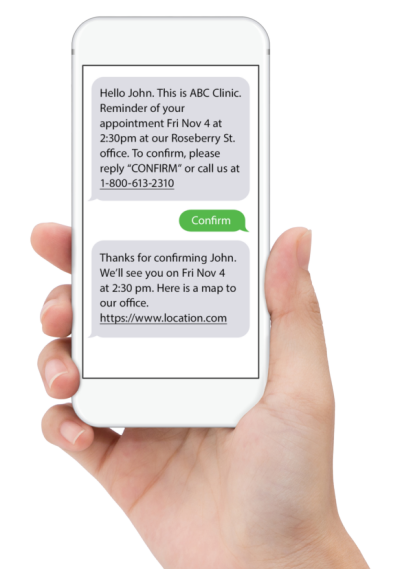 Phone numbers provided in the text message are displayed in standard format which allows the patient to initiate a call to the number with one click.